ALERTE SELF-CONTAINED SIREN/SPEAKER WITH SWITCH CONTROL. 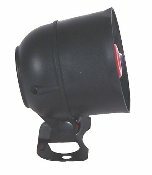 This unique siren/speaker combination is great for ATV or Dirt Bikes. Small and compact, measures 3 1/4"D x 4"H x 4"W. Weight: 8 oz. 20 watt / 12 volt. Wail tone only, 127 db. Includes handle bar waterproof 3 button switch control, 2-On/Off, 1 momentary.